Three brothers are driven into the heart of their father’s romantic life, tasked with fulfilling his startling last wish. Just one month after the prominent attorney patriarch dies at the age of 55, the grieving sons are handed a lengthy document by the lawyer managing their father’s estate. What the brothers discover about their deceased father are lessons in the art and grace of carrying a torch for decades, commitments of marriage through sickness and in health, and a bittersweet dignity that can only come from honoring a loved one’s final wish. The brothers — all uniquely different in personality, interests, and sexual orientation — wrestle deeply with intimate secrets about their father and themselves to discover the power of unconditional love. Open yourself to the possibility of such a love, for it is at the center of JUST DANCE THE STEPS. 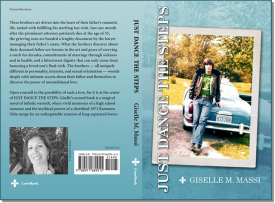 Giselle’s second book is a magical novel of infinite warmth, where vivid memories of a high school romance and the mythical powers of a cherished 1971 Karmann Ghia merge for an unforgettable reunion of long-separated lovers. “Wow. Very much enjoyed it! We could all use more light in our lives, and that is exactly what Giselle Massi gives us with Just Dance the Steps.” — Jeffrey Marx, Pulitzer Prize winner and author of ‘Season of Life’.